Friends School | Why Support Friends? Why should you support Friends School? Simply put, to help us continue the nearly 300-year-old tradition of providing a Quaker education, built on a framework of academic excellence, and that prepares students for the future. Gifts to Friends School have a profound effect on the quality of education we offer our students — that is, fostering traditional values, inspiring innovation, and instilling the confidence to challenge, inquire and take action. Friends students have a powerful impact on our ever changing world. We thank you for offering your support today. 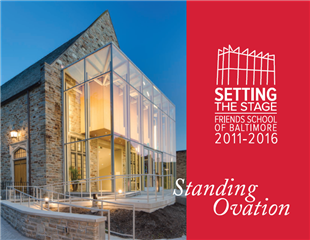 Read about the success of Setting the Stage in our final campaign report, Standing Ovation. of our yearly costs are covered by tuition. The rest comes from GIVING and other revenue sources. How can I support Friends? We invite you to explore the various ways you can make an immediate and direct impact at Friends School today. Your investment of time, talent and financial support matters. If you are interested in joining The Fund for Friends committee, a group of alumni, parents, and parents of alumni who help make calls on behalf of Friends, please email Caroline Rayburn at crayburn@friendsbalt.org. Honor your student’s birthday by placing a Birthday Book in our school library. Hint: every parent and/or guardian is already a member of the Parents Association. As alumni, you can keep in touch with classmates by volunteering as a Class Agent or Secretary (email Ashley Principe at aprincipe@friendsbalt.org). Thank you, we did it! With your help, we raised $25.8 million for the Setting the Stage campaign. With the help of the Setting the Stage campaign, we were able to complete the brand-new Forbush building which features a state-of-the-art performance facility.